Howard Rumsey, bassist and entrepreneur, has died at 97. Born in Brawley, California, working in Vido Musso’s band Rumsey met Stan Kenton. He got the job in the first of Kenton’s own bands in 1941 and was featured on the 1942 Decca release Concerto for Doghouse. 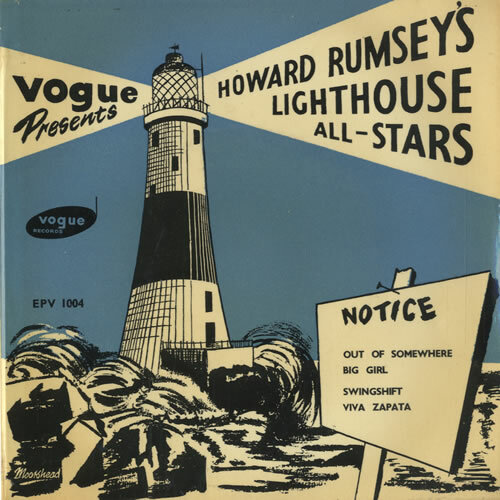 Rumsey worked with Charlie Barnet and Barney Bigard before forming his own outfit in 1949 to play at the Lighthouse, a café establishment, in Hermosa Beach. The Lighthouse, Hermosa Beach, was to achieve world-wide fame. 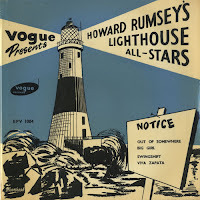 The Lighthouse All Stars – Rumsey’s resident band – certainly lived up to the name. Alumni include Shorty Rogers, Bud Shank, Bob Cooper, Max Roach, Jimmy Giuffre, Shelly Manne, Maynard Ferguson and Rolf Ericson. A who’s who of the 1950s jazz scene sat-in when out on the West Coast including Chet Baker and Miles Davis. Rumsey recorded several albums for Contemporary. The Lighthouse years secured his legacy. Howard Rumsey died on July 15 in Newport Beach, California. In recent years Tony Eales, friend of Bebop Spoken Here, had the privilege of getting to know Rumsey when attending big band festivals on the West Coast. Thanks to Tony for conveying the sad news. Always a great line up at the Lighthouse.